Baby king cobra hatchling – juvenile, found in Southern Thailand. I was hoping this year was going to be THE YEAR I found a king cobra hatchling – at least one under a meter. Alex Gillard made it happen for me, I didn’t get to find it, but we were at the same place and I’d actually just passed the place he found the little king – about 30 minutes before. Good enough for me, I just wanted to see one in the wild and get some photos and videos. This has been my target species for about ten years now. I’ve found some adults, and one adult even found me, but I have never seen a king cobra in the wild less than three meters in length. Juvenile king cobras are very difficult to find. People say they’re ‘smart’ – and yeah, I guess they are. I’ve never even heard of someone finding a hatchling king in the wild. One time a doctor from Malaysia sent me a photo of a tiny hatchling outside his clinic – in the middle of the day. It had probably just hatched. Certainly, nobody goes looking for and finds king neonates. So, anyway. My life is complete. Enjoy the photos of this stunning little one-month old king cobra found in Krabi. I don’t know how many times I’ve been herping over the last ten years, certainly well over 1,000 times. And still, I’ve never found one myself! Author VernPosted on July 28, 2017 July 28, 2017 Categories front-fangedTags hatchling, hooded cobra, juvenile, king cobra, neonate, Ophiophagus hannah, thailand1 Comment on King Cobra Hatchling Found – 2017! In Greek, ‘snake eater.’ Sometimes called ‘Hamadryad.’ Discovered and described by Danish naturalist, Theodore Edward Cantor in 1836. The species name, hannah reflects the snake’s arboreal habits, from Greek mythology it refers to tree dwelling nymphs of the same name. Ophiophagus hannah occupies its own genus, Ophiophagus. This is different from other cobras in the Naja genus which have multiple species within the genus. There has been talk about breaking up the genus into a number of species, as differences exist in coloration, scalation, and in comparison, king cobras can be easily distinguished by the shape and size of the neck hood. Kings have a longer, thinner hood. Other cobras grow to maximum length around two meters in length – much smaller than king cobras. 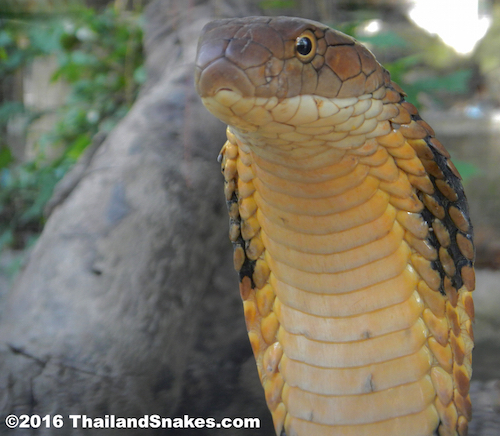 The king cobra has chevrons lighter in color than the body color, on the neck and body that may be very pronounced, as in kings from China, or muted, as we see on melanistic king cobras here in Southern Thailand. 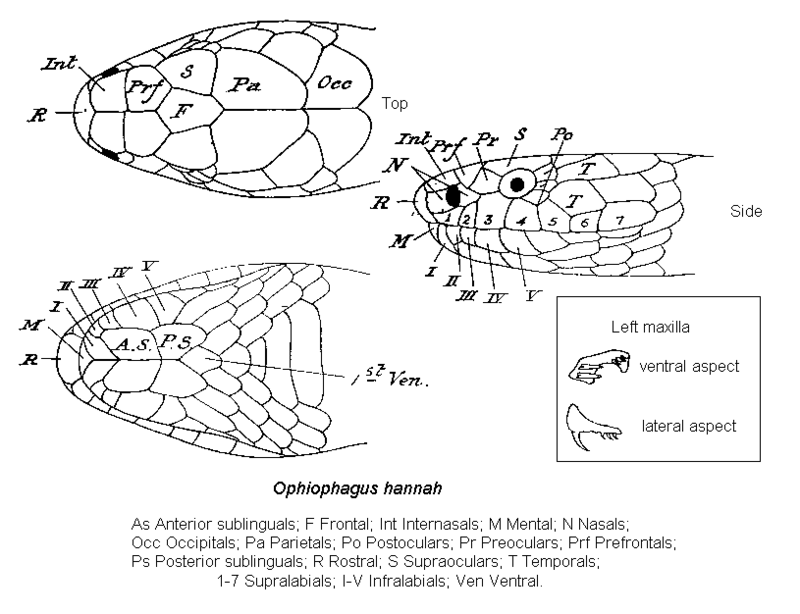 A technical difference between Ophiophagus hannah and all other cobras is the existence of a pair of scales on the top and rear of the head called, ‘occipital scales.’ They are located adjacent to each other behind the usual 9-scale arrangement typical of colubrids and elapids. Image from Creative Commons – Wikipedia. Link here. In Thai language, it sounds like Ngoo how chang (literally “snake cobra elephant”, or ngoo chong ahng. There are many names for this snake. Max length about 5.85 meters. The presenter at the Queen Saovabha Memorial Snake Institute in Bangkok said the largest king was caught in Nakhon Si Thammarat in Thailand’s south, near Surat Thani province and it was 19 feet 2 inches in length. All over Thailand and most of Southeast Asia. Ophiophagus hannah. Venomous and potentially deadly. Grows to around to 6-meters. Eats other snakes primarily. If bitten, victim may die within 10-20 minutes. I’ve seen a few king cobras (hamadryad) in the wild. One I saw in a park in Krabi – just the tail as it crossed the road behind me. I’m guessing it was an eight meter long snake. I know it is probably impossible, but I’m not joking. The tail was absolutely massive, longer and thicker by nearly double that of other 5-meter kings I’ve seen many of. This was quite possibly the biggest King Cobra in the world. Another king I saw on the island of Penang, in Malaysia. I was coming down a very steep hill and I saw this 3-4 meter king cruising through the dense underbrush. It was absolutely awesome to see it there when there were so many people climbing the hill close by. Another time I saw a king about one-hundred twenty meters in elevation up a limestone mountain in Krabi province. This one rested on the steps of a popular temple – Wat Tham Seua and I had to move it away so people could come down the steps. A large four-meter long king that was very fast! Note to self – don’t try to move a king that is higher than you are (it was on steps up ahead of me and was very fast to come down to attempt to strike at me because it had the height advantage. 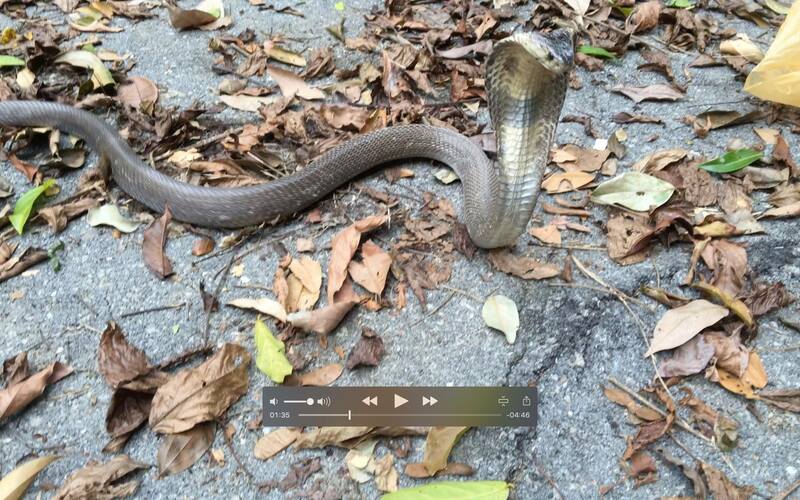 Recently Tom Charlton and I found a 3-meter king cobra in Krabi and got some great shots and video of it. Facebook photo of it here. Kings are all over Thailand and can be found near houses, or really – just about anywhere. But they are not found often. They are tremendously strong and smart animals. Please give the snake a large space and do not poke it with a stick. They are very fast moving. Juvenile king cobras can also kill you. Their venom is every bit as toxic as adults. One study done by the Queen Saovabha Memorial Institute in Bangkok showed that king venom is actually more toxic the younger the snake is. Kings like many types of habitat. Dense forest near water and open grasslands. Love bamboo thickets for a nest. Ideal cover is a web of small bamboo growing about a meter high with soft bamboo leaves underneath. The King I found last night was up a limestone mountain around 100 meters elevation. In Thailand they are often found wherever rat snakes might be found because they seem to prefer them. Kings seem to prefer mountains. The other two I found were also at some elevation (200 m and around 500 meters). King cobras are usually terrestrial, but have been found many times in trees. Another interesting bit of information is that the king cobra is said to be able to see as far as 100 meters during daylight. The snake is mainly diurnal – found active during the daytime, but can also be active also at night. King cobras eat other smaller snakes primarily, but also will eat monitor lizards. Occasionally they’ll eat other king cobras, pythons, lizards, birds, rodents. I saw a 5-meter long king attempting to eat a 2.5 meter reticulated python. The King appeared intimidated by the strength of the python – it’s no pushover. Here is a photo of a 3 meter king eating a 2 meter red tailed racer snake. King Cobra eating a Red-tailed Racer (Oxycephalum gonyosoma) Snake – Thailand. 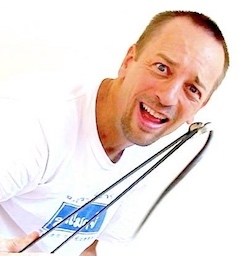 Copyright 2009 Vern Lovic. Lifts its head off the ground sometimes by as much as 4-5 feet, and flattens out the neck. The hood of a King cobra doesn’t flare as wide… but, a big King will scare you much more because they can be 5 times as long as the monocled or other cobras! These snakes are not usually that afraid of people, and move slowly to ‘escape’ if they move away at all. Last night I moved a 4 meter king off some steps at a local temple so people could pass. It was not in ANY hurry to get away, and it came at me a couple of times. Impressive snakes, and not to be taken lightly. I know a man personally, his brother was bitten on the upper arm/shoulder and died in less than 10 minutes on the way to hospital. 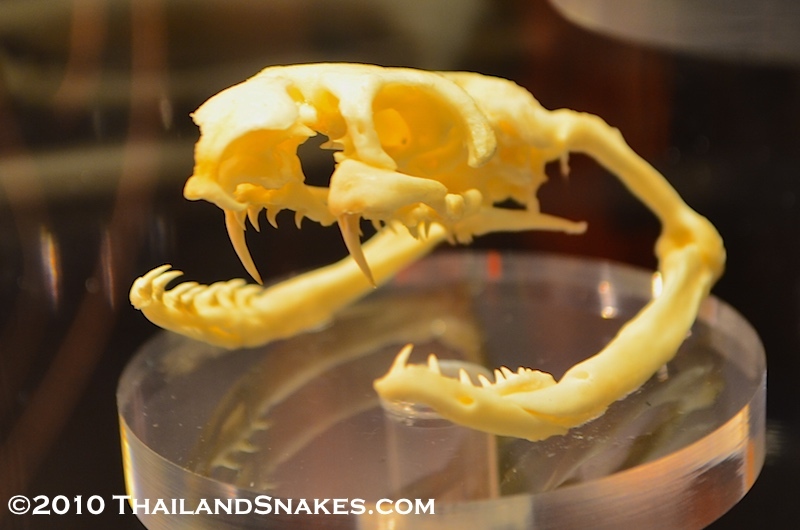 King cobra skull showing large teeth and thick, rather short fangs for injecting venom during envenomation. Very toxic, but monocled cobras (Naja kaouthia) and kraits (genus Bungarus) are more potent on the LD50 scale. The power of the King is in the volume of venom it can inject in one bite – maximum around 7ml! Kings can (and have) killed elephants with a good bite. More information on venom constituents and treatment for king cobra snakebite here. 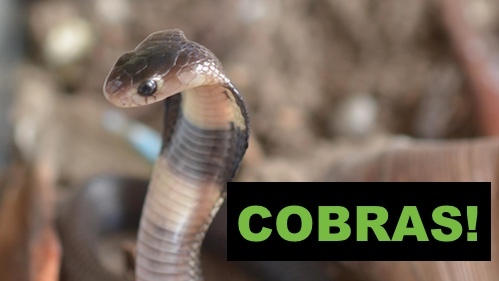 There is a specific antivenin for the king cobras manufactured by the Red Cross Queen Saovabha Memorial Institute in Bangkok, Thailand and available online for about $110 (May, 2015) for enough antivenin to counteract .8ml of king cobra venom. If the hospital you’re in does not have it in stock and cannot order it quickly from another nearby source, there is an alternative. Tiger snake antivenin can also work well. Online: Snake-Antivenin.com (no affiliation). Ophiophagus hannah is the only snake known in the world that creates a nest (usually of bamboo and other leaves). This snake lays eggs which they stay with in the nest until ready to hatch. When the eggs begin hatching, the female king leaves because it eats other snakes primarily – and would likely eat the young. The young are fast, and deadly from the time they hatch. 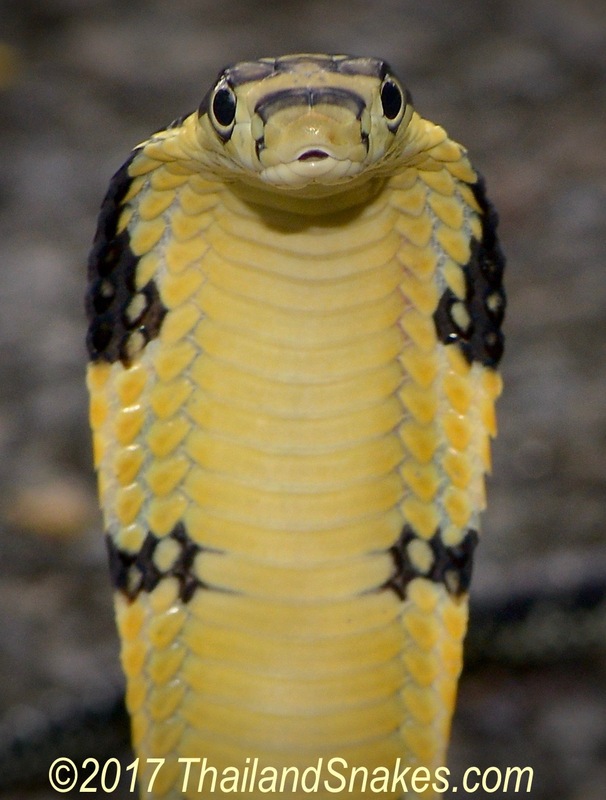 Juvenile king cobras from Thailand have yellow bands across their black bodies and heads. They look radically different from adult king cobra snakes. There is a danger of mistaking them for mangrove cat snakes (Boiga dendrophila). Young king cobras spend their early months, and possibly years in the trees. However, recently (Spring 2016) I have found two hatchling king cobras dead on the road in Krabi. Did they attempt to cross the road immediately after hatching while in search of a proper tree to climb? Not sure. Would love to find out. 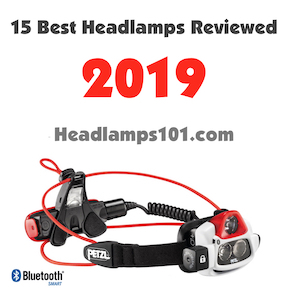 If you have any insight – do let me know! Ophiophagus hannah has been assessed as Vulnerable. This species has a wide distribution range, however, it is not common in any area in which it occurs (with the apparent exception of Thailand, and there only in forested areas), is very rare in much of its range, and has experienced local population declines of over 80% over 10 years in parts of its range. Pressure on this species from both habitat loss and exploitation are high throughout this snake’s range, and while no quantitative population data is available, it can be conservatively estimated that the population size has declined globally by at least 30% over an estimated three-generation period of 15-18 years. More detailed population monitoring in the more poorly-known parts of this snake’s range may reveal that this is a conservative estimate. I mentioned earlier having seen many dozens of king cobras run through the snake show here in our local area. That is just one King Cobra Show out of perhaps a dozen in the country. If every show caught and disposed of 50 king cobras annually, that’s 600 adult king cobras yearly that are being depleted from the forests just here in Thailand. Kings mate once per year and their eggs are highly vulnerable to predators like monitors, other snakes, rats, and weather phenomena like high humidity and monsoon rains. Kings lay eggs just before the rains start. My best guess is that king cobras are disappearing from the wild at a frightening rate. We only mentioned snake shows here, but what about all the king cobras that are found and killed across southeast Asia for food, or out of fear? There must be hundreds more, perhaps thousands per year more that are killed by people that come across them. I hope the IUCN Red List updates their listing for Ophiophagus hannah and assigns a label more serious than “Vulnerable.” Something drastic is needed to save the country of Thailand’s wild king cobras before they disappear like they did in Penang, Malaysia. Notice the light chevron across the back of the mid-body (right) ? Until the King flares his hood you can tell it’s a king by those bands. In addition, the head is very distinctive, and large compared to any other snake except a Python. Copyright 2009 Vern Lovic. The kings in these photos are all beat up from bashing their faces against the cages at a snake show in Thailand. In the wild they are so beautiful… majestic, amazing snakes. I was so glad to see my first one in the wild. Even better to interact with it. Gotta love Thailand! 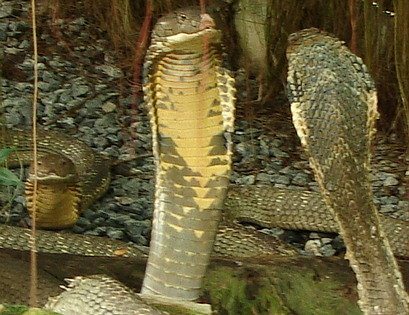 This page is focused on King Cobra (Ophiophagus hannah) snakes because their demise is imminent here in Thailand, and already in most countries they are not found in near the numbers they once were. On the island of Penang in Malaysia, it is said that kings can only be found very occasionally on the mountain. They used to be common. I was lucky enough to see one there on a very steep section of the hill while descending. It was three to four meters long and much thicker than my forearm. It was in the underbrush, moving slowly, perhaps thinking it was unobserved. That was two years ago, and maybe that snake has been a meal for someone by now. It’s entirely possible. In Thailand I’ve watched just one snake show take over fifty king cobras each year out of the wild. They ‘rescue’ them from homes, yards, businesses, gardens, and farms. The kings spend a couple weeks or months rubbing their faces raw and bleeding against the fence trying desperately to escape. Some of them are put in the king cobra show – where they are teased mercilessly three to ten times each day for tourists that are interested in seeing snakes, but don’t really understand the state of the kings that are held there. I cannot imagine that king cobras as a species have more than another few years of existence in Thailand, Malaysia, Philippines, Laos, Singapore, and Taiwan. The IUCN Red List site lists king cobras as ‘Vulnerable.” Kings are being collected and sold in great numbers to buyers in Bangkok who cook them up as a meal, or send them on to China for the same purpose. It wasn’t long ago that the Queen Saovabha Snake Farm – “The Red Cross Snake Farm” in Bangkok was ‘broken into’ and something like seventy king cobras were ‘stolen.’ Hmm, wonder where they went. Seventy king cobras had to fetch a nice price, I’d think. Tens of thousands of US Dollars – easy. Not accusing, it’s just a very sad state of reality for these and other snakes poached for their skin, blood, bile ducts, tongues, and meat. So this page will be a collection of all the best information I can source about my favorite species of snake, King Cobra – Ophiophagus hannah. If you have some article, book, documentary, photo, video, or other bit of information you’d like to see listed here, just write via the contact form at this link. It is found under the HOME menu at the top of all pages. Update 7/20/2016 – I’ve seen a number of king cobras in the wild now over the years. Four of them have been hundreds of meters high on mountains. 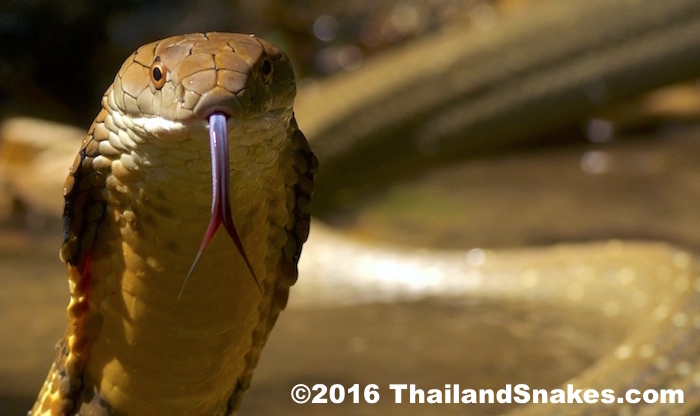 Many snake enthusiasts want to come to Thailand to see king cobras, and I have to tell them… the chance of seeing one is slight. I’ve lived in Thailand for ten years and I’ve seen only a handful, and I’m in the rainforest often. Your best bet is to come to the country and stay for a couple of months. Stay at PhanomBenchaMountainResort.com in a bungalow, and hike during the days around there. That’s my best advice. Your chance at seeing a king cobra is not high – you would probably need weeks of walking around during the day to see one. It’s all luck! Thais are a bit crazy about cobras – it is the most easily recognized snake, and though I have met few people that can identify other snakes, most know what a cobra looks like. There are even amulet necklaces of cobras! 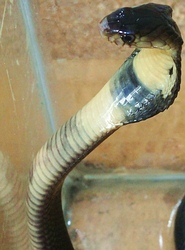 Adult Malayan (Blue) Krait from Thailand. These are common across much of the country, and have a very potent neurotoxic venom. Contact with this krait should be avoided. Note: About 50% of all bites from this krait results in human death – even with the administration of antivenin (antivenom). Death is the usual result if no treatment is given. The closely related Bungarus multicinctus is ranked 3rd in the world for toxicity of venom based on some LD-50 data (terrestrial snakes). Do be careful. Length: Max length about 1.6 meters. Range: All over Thailand and much of Southeast Asia. 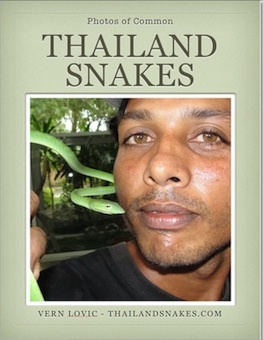 Notes: I’ve caught scores of these snakes since 2006 in Thailand. They are quite distinctive from other black and white banded snakes when adult, but when hatchling or juvenile, the differences are almost negligible. 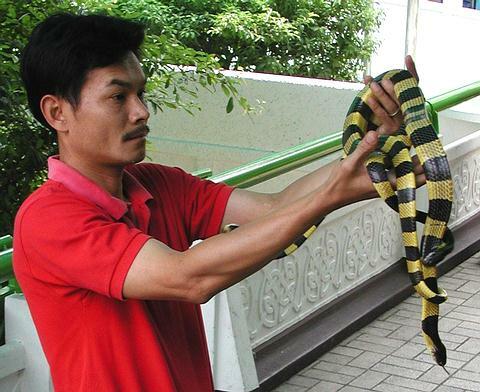 Do be very cautious to not hand-hold any black and white banded snake in Thailand. The risk is too great. 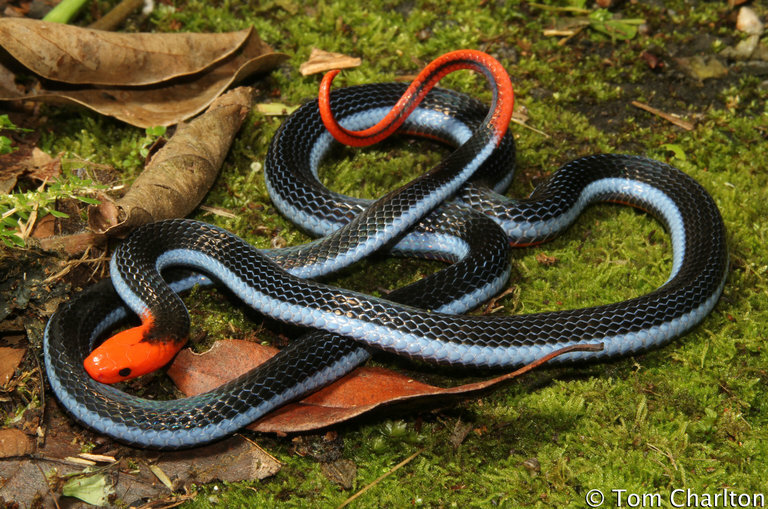 The head of the Blue Krait is not nearly as large as the yellow and black “Banded Krait” (B. fasciatus). This krait’s body doesn’t have the high vertebral ridge either. Be careful around these snakes, their venom is very potent. Habitat: These snakes appear to favor flat country though I have found them on hills of 250 and 300 meters elevation. Not found higher than 1,200 m above sea level often. They prefer proximity to water, rice fields, and rice dams. To find a nest, this krait invades and takes over rat holes in the ground. Active Time? The snake is mainly active at night and is not fond of the sunshine. They are shy and attempt to cover their head with their tail. I tend to find them active most consistently between 9 pm. and 11 pm. Food: Other snakes – primarily, but also lizards, mice, frogs and other small animals. Defensive Behavior: Not what I would consider aggressive or strongly defensive. They don’t tend to bite unless really provoked. Still, you should never hold one. I have only seen one in a dozen of these snakes attempt to bite, and it was the result of being grabbed with tongs near the head. Venom Toxicity: Very toxic – even stronger on the LD-50 scales than Naja kaouthia (cobras). Bungarus krait venom is neurotoxic and attacks the human nervous system, shutting it down. Coma, brain death, and suffocation due to paralysis of the muscles and nerves necessary for crucial functions like the diaphragm, and or heart, are frequent causes of death. Death results usually 12-24 hours after an envenomed bite that is not treated. Little or no pain is usually felt at the bite location. After envenomation approximately 50% of bite victims will succumb to the effects of the venom, dying usually from respiration stopping when the diaphragm stops. Bungarus candidus. Malayan Blue Krait, Malayan Krait. Highly toxic and potentially deadly venom. White/black. Scroll down for 1 more photo. Handling: The banded and Malayan blue kraits are not known to bite during the daytime. That doesn’t mean they don’t, it just means they don’t do it commonly. At night these snakes bite rather easily, as evidenced by the numerous bites that occur at night to people usually laying down to sleep on the floor. Handholding the kraits for any reason seems rather absurd to me, yet snake-handlers across the globe do it regularly. The krait venom is so toxic, it’s just not worth the risk – however small. After catching many of these snakes in the wild – I’ve seen them bite the snake tongs just once. Antivenin | Antivenom: There is a specific krait antivenin that is given for Malayan Krait bites. If you don’t have access to that antivenin you can ask the hospital if they have Tiger Snake antivenin – which can be used as a substitute for krait antivenin and works well. Offspring: Lays 4-10 eggs. Juveniles are 30 cm long at birth. Hatching occurs in June-July in Thailand. Notice the thickness of the bands on this deadly Krait… Wolf snakes have similar coloring and style of bands, but the bands are much thinner. Wolf Snakes are harmless. Yellow and black Banded Krait (Bungarus fasciatus) venomous and deadly. Copyright Tom Charlton. 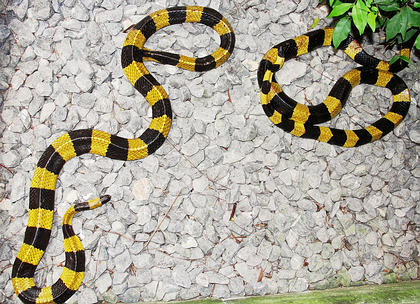 These are yellow and black kraits here in Thailand. In some other part of the world (Borneo) they are black and white. 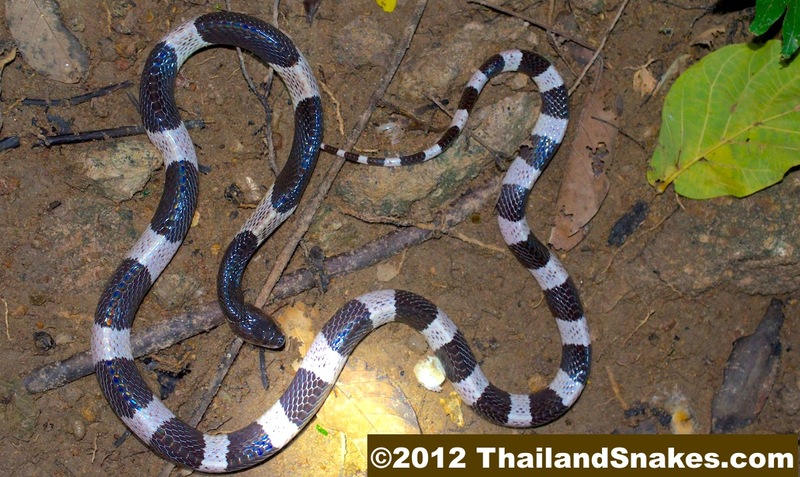 There are also “Blue Kraits“ aka “Malayan Kraits” which are black and white. And the really incredible looking Red-headed Krait which looks nothing like either of them. 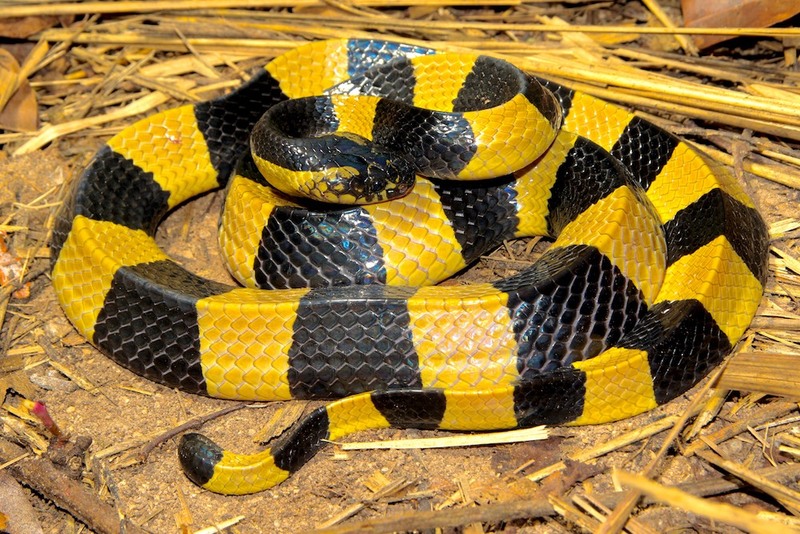 Yellow Banded Krait. Highly venomous, deadly, and relatively common in Thailand. There is a white and black version also called the Blue Krait. See page on right side. This photo is of a man at the Red Cross Snake Farm in Bangkok. Thais say: (ngoo sam lee-um, or ngoo kan plong) This is a bit confused in Thailand where, in southern Thailand any viper is known as Ngoo sam lee-um. Lee-um means triangle, and so some people confuse triangle shaped heads of the vipers with triangle cross-section of the kraits. 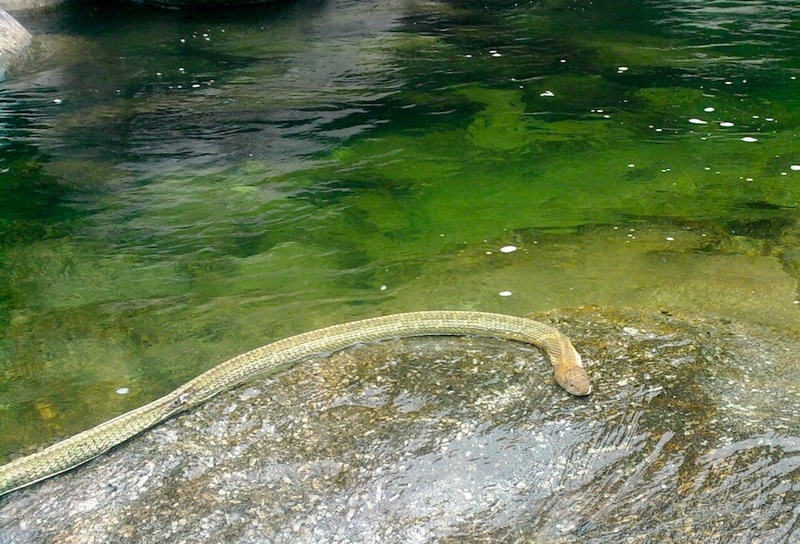 Length: average 1.5 m up to 2 m (about 6.5 feet) In Thailand they don’t usually reach a full 2 meters. Notes: I have yet to see a live banded krait in the wild, except a few dead on the roads – but I don’t go digging up ratholes or termite mounds. I may start if I don’t find one soon. I’ve been looking for three years to find a krait with yellow and black bands like these. At dinner last night I was looking around a small restaurant with many ponds, for snakes. I asked the owner’s son if they had seen any. He said, Ngoo Sam lee-um. That could be the one. I’ll get their permission for some late night herping and try to bag one. I’m sure they’ll appreciate it. This restaurant is located on a small hill close to sea-level in southern Thailand. There are many frogs at the ponds, and probably many snakes too. Update 2015- I’ve been to that restaurant numerous times and not had a call from them about this krait. I am not sure they have been found in Krabi. I have never found road kill B. fasciatus here in Krabi. 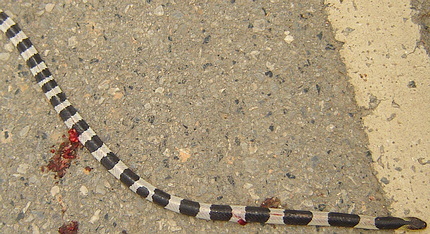 I have found a large 2 meter dead on the road banded krait in Surat Thani on the main highway leading to Krabi. Habitat: This Thailand krait lives on the ground and in rat holes and termite mounds, under stumps or rocks and in other cool, damp places. Recently I saw photos of one in some limestone rocks here in Thailand. They prefer wide open areas near water. They have been found as high as 1,524 meters in Malaysia and about 2,300 meters in Thailand. Active Time? The snake is mostly nocturnal and is quite active at night. Most bites occur at night, as the kraits move close to people sleeping – usually on the floor, and probably the person moves and the krait bites. More dangerous at night, during the day they are not biters. 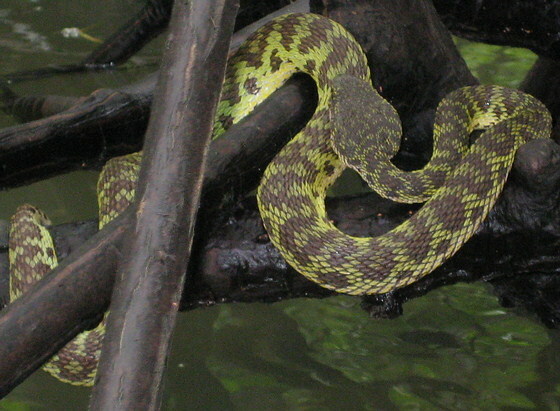 These kraits are common in the northeast Thailand provinces. Recently a six year old boy was bitten and could not be revived. 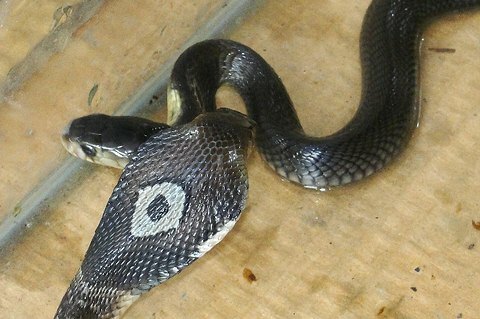 The snake had come up into their home in Surin to escape some flooding. Food: Other snakes almost exclusively – rat and cat (Boiga) snakes. In captivity I have seen them eat the following live snakes: Calloselasma rhodostoma, Chrysopelea ornata, and Gonyosoma oxycephalum. One noted herpetologist states that these kraits don’t like to eat water snakes. Will also eat rats, mice, frogs, lizards if snakes cannot be found. Defensive Behavior: The banded krait is slow acting during the day, lethargic, and usually not interested in striking. However, it can protect itself quite well – it is a strong biter and has been recorded as killing a large type of cattle 60 minutes after a bite. 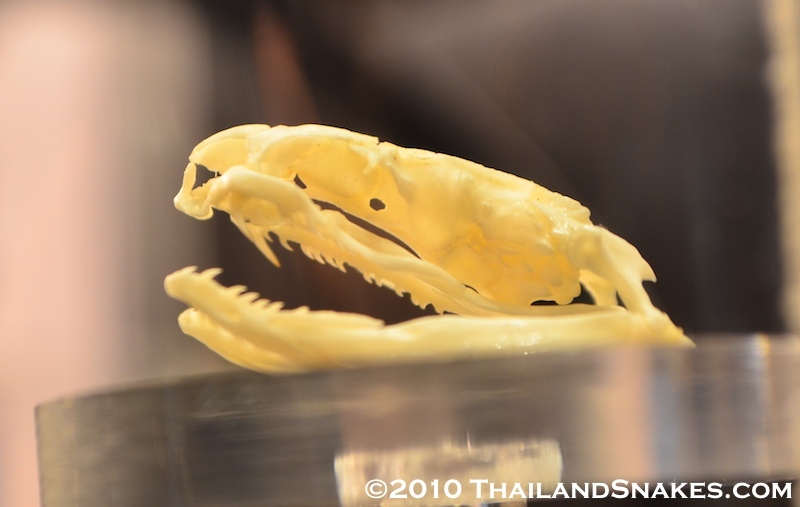 Banded Krait skull showing fangs, jaw, and other dentition. 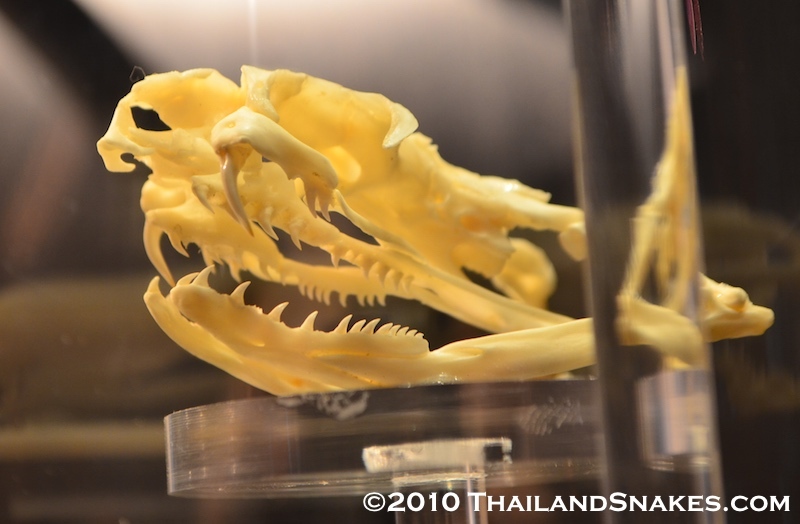 Skull located at Queen Saovabha Memorial Institute in Bangkok, Thailand. Venom Toxicity: Very toxic. Deadly. This yellow/black banded krait from Thailand appears to have venom that is very toxic to humans. The typical LD-50 studies to assess the toxicity of venom in mice, rate this as a very toxic venom as well. These snakes rarely bite during the day, but if they do, they can transfer enough venom to kill you. I read about a person dying in 30 minutes, and another dying in 15 hours. A famous American herpetologist, Joe Slowinski, was killed by a baby krait (Bungarus multicinctus) in Burma while on a remote expedition. He finally succumbed after 30 hours. They can be quite deadly. The cause of death is that your muscles are paralyzed and your diaphragm can’t work any longer to pull oxygen into your lungs. Kraits are very deadly in this regard. However, if you are able to get to a hospital with a ventilator you will likely be OK. 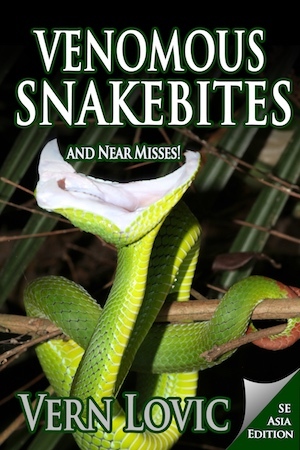 There is no specific antivenin for snake bites from this snake, but polyvalent venom is used – which can also treat bites from Naja kaouthia and Ophiophagus hannah. Interesting to note… when fed on a live garter snake the krait venom acts instantly to cause death. Apparently krait venom is very efficient with snakes – the krait’s primary diet. Handling: The banded and Malayan blue kraits are not known to bite during the daytime. However, at night time they bite rather easily, as evidenced by the numerous krait bites that occur at night to people usually laying down to sleep on the floor either outdoors or in their homes with the door open. I would never handhold kraits like the man is doing in the photo above. The krait venom is so toxic, it’s just not worth the risk – however small. Update: I was contacted by a man who was bitten by this same type of krait during the day at an impromptu show at a bar in Bangkok during the daytime. It bit his arm. He was lucky to live, and had lingering effects for more than two years after the bite. Antivenin: Polyvalent. It is advised by experts to get antivenin in your blood stream for krait bites before you have symptoms because, once symptoms develop you may have lost nerve functioning that will likely not return. Offspring: Mating in March-April and 4-14 eggs laid about 60 days afterward. The mother krait remains with the eggs for another 60 days before they hatch. Baby kraits are about 30cm long at birth, and have venom. I couldn’t find in the literature whether the mother left the eggs as they started hatching – so she didn’t eat them herself or not. 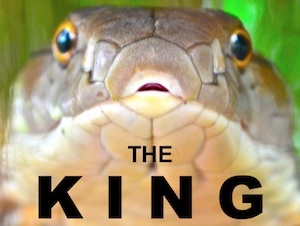 The King Cobra does this instinctively because it also eats other snakes. Quite deadly, but shy snakes – see the video below. 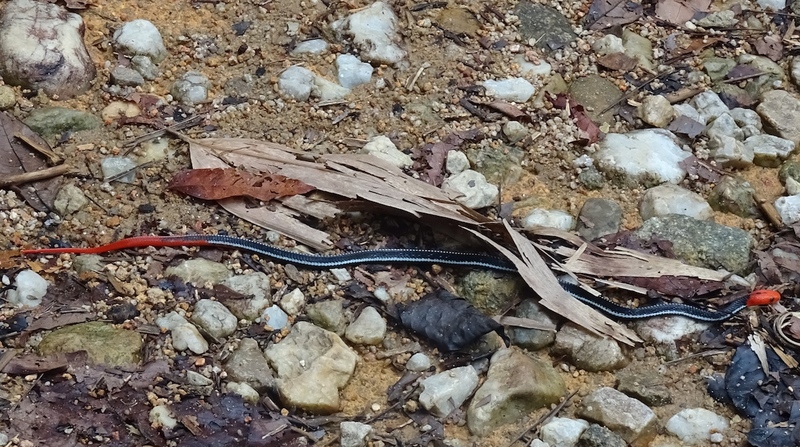 Range: These small coral snakes are found all over Thailand and some other countries in Asia. I have seen a couple dozen of these snakes in southern Thailand, usually found by people in their potted plants outside. Habitat: These snakes enjoy the leaf litter, loose dirt, and cool areas under rotting trees and other foliage. Occasionally they are seen dead on the road during or after rain when they probably come up above ground to avoid water. They are very rarely found during the daytime, and one scientist said they are usually only seen during September and October. But, I’ve seen them year round. Active Time? Nocturnal – active almost exclusively at night, or underground during the daytime. Food: Very small snakes like the Brahminy blind snake, worm snakes, worms, and probably termite, ant, and other insect eggs. Defensive Behavior: They curl up their bright red (pink or orange), white and black spotted tail as a defense mechanism. These snakes have little else for defense, as they don’t usually attempt to bite. The mouth on the Calliophis maculiceps is very small, yet they are fully capable of biting and envenomating humans. Venom Toxicity: This is a coral snake, so, the potential for life-threatening envenomation does potentially exist. Their venom is neurotoxic. There are places on the human body where this snake could get a good bite in, given the chance. Between the fingers and toes is an ideal piece of skin to bite. Just be very careful with these, and all coral snakes. Just because a snake has not been known to cause significant envenomation in the past, doesn’t mean it won’t happen. If you keep this snake as a pet – be very careful not to get too comfortable holding it – it is potentially a deadly snake. Offspring: One scientist noted a clutch of just 2 eggs. Notes: These are remarkably beautiful snakes, and yet so small that they could be mistaken for a worm of some sort if. Body patterns can differ slightly. Some, like this juvenile exhibit black stripes and spots. Some have just spots. Some are almost uniformly brown with very few or light spots. The body of this coral snake is round, without a pronounced vertebral ridge. The belly is bright orange, and the tip of the tail has white and black. When the tail is raised, it is quite stunning. These snakes are common, and are kept as pets across the world. This juvenile speckled coral was about half the diameter of a pencil. Defensive behavior of Calliophis maculiceps. Calliophis bivirgata flaviceps. ©2012 Tom Charlton. All rights reserved. Used with permission. The Blue Malaysian Coral Snake is a venomous elapid and is one of the most strikingly beautiful snakes you’ll ever see. I’ve been lucky enough to see one crossing the road in southern Thailand and I didn’t have any snake hook to grab him. 3 Sub-species: C. b. bivirgatus in Java – lacks blue stripes on ventral. C. b. flaviceps in Thailand, Burma, Laos, Cambodia (possibly, no records), Peninsular Malaysia, Singapore, Sumatra and various islands of the Riau Archipelago. C. b. tetrataenia in Borneo has a light yellow stripe on side, without blue stripe. Range: This beautiful coral snake is found from around Phang Nga and south into Peninsular Malaysia. Habitat: Usually found at some elevation – over 400 meters. 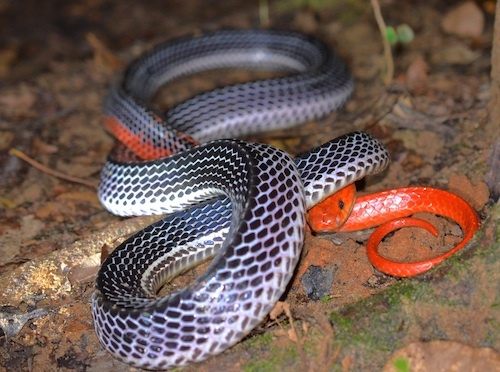 Calliophis bivirgata prefers heavily wooded and wet areas of primary and secondary rainforest. They seem to prefer living under and foraging under and on top of leaves and fallen trees and rocks. Red-headed Krait Snake Bungarus flaviceps.. This snake looks VERY similar to a Blue Malaysian Coral Snake (Long-glanded Blue Coral). This snake came from Phang Nga province, Thailand. Copyright Anders Henry. Used with Permission. Active Time: These corals snakes are found typically at night, but on rainy and cloudy days they can also be found to be active in the daylight, like some other coral snakes. Description: Medium sized, though large for a coral snake, this snake reaches 140 cm typically, and up to 170 cm. or so, have been recorded. The body is mostly deep blue or black with light blue or white stripes along the lower ventral side of the body. The head, venter (belly), and tail are brilliant red. The nose is blunt for foraging the leaf litter where it spends most of its time. Dorsal scale count: 13-13-13. Defensive Behavior: Always avoiding man and other large threats, they can be very fast as they flip about almost spastically. 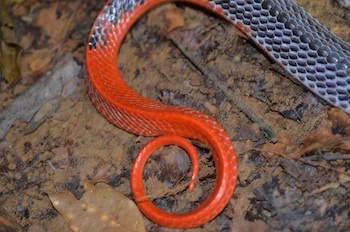 When they are trapped and tailed, they may attempt to flip over on the dorsal side, exposing a brilliant ventral of red, orange, and pinkish color. During foraging these snakes are very slow moving. Food: Prey includes other snakes, lizards, frogs, birds. Danger: All coral snakes must be treated as potentially lethal snakes. That said, many people free-handle these snakes at their own peril. Deaths have occurred as the result of envenomation by this snake. One man in Singapore was reported to have died within five minutes of envenomation. Do be exceptionally careful and never hand-hold any deadly snake. Venom Toxicity: Neurotoxic venom which does not initially present with much pain at the bite site is immediately acting to block nerve impulses. The wound may become numb, and lips may also get numb. Difficulty in breathing occurs as the venom shuts down muscle contractions – the diaphragm and other major muscles. General Approach to Management: All cases should be treated as urgent and potentially lethal. Rapid assessment and commencement of treatment for symptoms is mandatory. Admit all cases. Offspring: Oviparous and clutches of 1-3 eggs. Notes: One of the most impressive snakes to see in the wild. Fairly common in deep Southern Thailand and Malaysia mountains. This snake is easily confused with Calamaria schlegeli in Malaysia, Singapore, Bali, Java, and Sumatra. 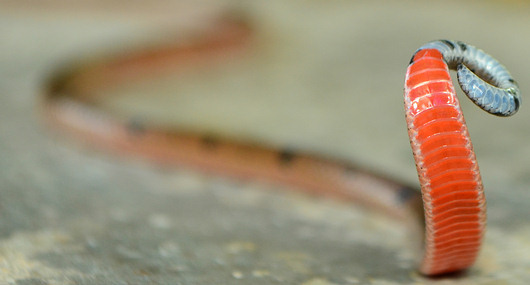 C. schlegeli is the Red-headed Reed Snake, which is harmless. The reed snake has smaller scales and no red tail or venter. Venter is grey and white. Thanks to Robert Abrams for permission to post these photos and story. Amazing Thailand. 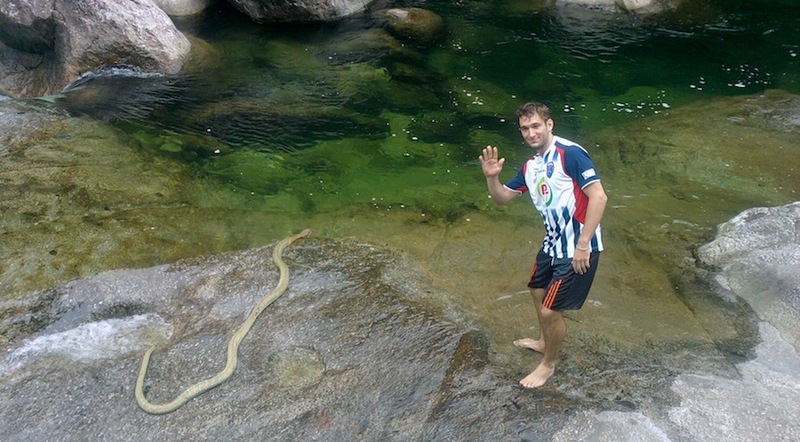 Robert Abrams sent me some photos of a snake he said washed over Menora waterfall he was relaxing at, the location is about 40 km outside of Ampur Muang, Phattalung province, southern Thailand. 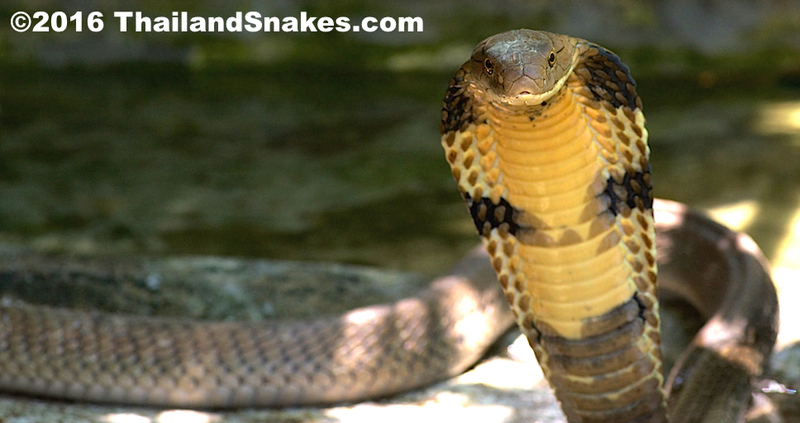 It was none other than the ultimate venomous snake, the king cobra. Amazing! 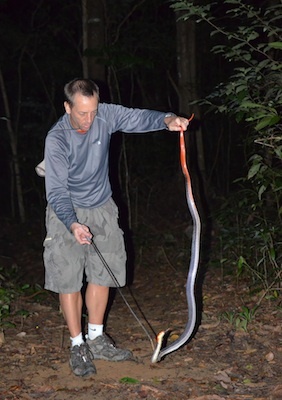 Some people never get to see a king cobra in the wild – and this one almost dropped in Robert’s lap. I’m glad he didn’t reach it with a stick like he was trying to. Originally he thought it was a rat snake, which is harmless. It looks to me like the snake was probably run over by a motorbike or other vehicle and went back into the wilderness to try to mend itself. It was likely ready to die though. That looks like a wicked injury. Both images, Copyright 2013 Robert Abrams. 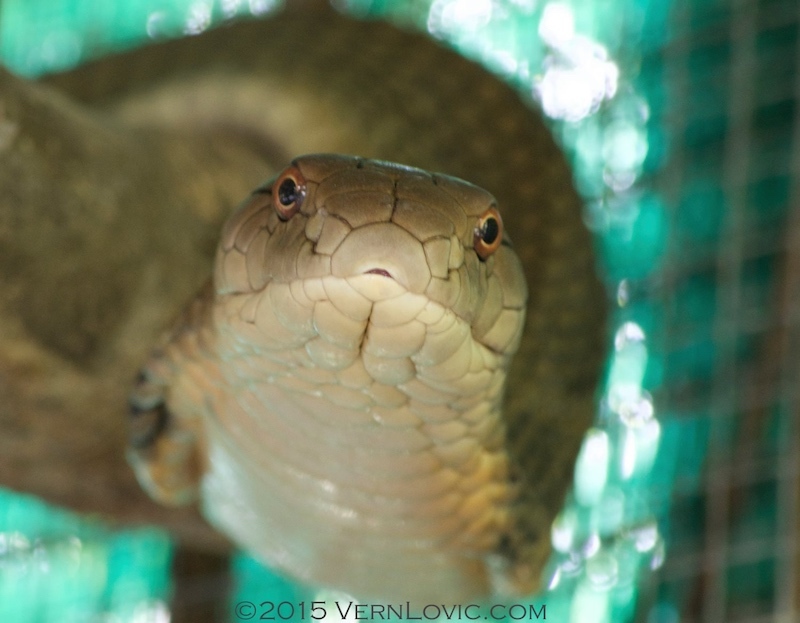 More information about the King Cobra Snake here!